We are excited to bring you this show as it talks about how one of our main goals for 2016. 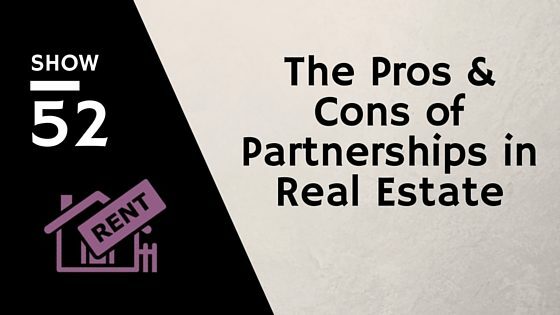 In Show 52, Kirk and I, discuss the pros and cons of partnership deals. We recently have closed on two properties and both were partnership deals with different partners. Throughout the show we talk about why partnerships may be good a idea for rookie investors, especially when partnering with a seasoned investor. This can allow you, as the rookie, to take the plunge while learning from someone with experience. Will both parties be contributing financially to the deal? Will the financial contributions be equal? Who will be on the deed or loan? Who is going to be managing the property? Who is in charge of tracking expenses and paying the bills? These are just a few of the things that anyone getting into a partnership should consider and discuss with their potential partner early in the relationship. Making sure you take the time at the beginning of the relationship to talk about the 'what if' scenarios and how you will respond to them is critical to the success of your partnership. You need to talk about how you will respond if your property is vacant for months or you have to evict a tenant. Put these action plans paper so that you have something to reference when these inevitable things happen.